Melt the butter on medium-high heat in a small deep saucepan, let it simmer until the foam on top gets brown and it starts smelling like toasted hazelnuts. Set the saucepan aside to cool for 15 minutes. (In the end some of the water will have evaporated and you will end up with around 180g-185g, that is the amount you need). When the butter has cooled down a bit, but is still warm, pour it into a large bowl and add the erythritol, whisk until it has dissolved. Add the eggs and vanilla extract, whisk well. In a small bowl mix together the sesame flour, almond flour, xanthan gum, salt, and baking soda. Add half of the dry ingredients to the wet and fold until combined. Add in the remaining dry ingredients and the chopped chocolate, mix thoroughly, cover the bowl and chill for at least 4 hours. Once your dough has chilled for at least 4 hours, divide into 26 balls about (30g-31g each), flatten them slightly. Store the raw cookie balls in an airtight container in the fridge for up to 5 days. To Bake: Preheat oven to 375ºF / 190ºC without the fan/ventilator switched on. Bake the cookies on a parchment lined baking tray for 8-9 minutes or until the edges are light brown, but the center still looks a bit under-baked. Remove the tray from the oven and allow for the cookies to cool on the tray for 10 minutes. 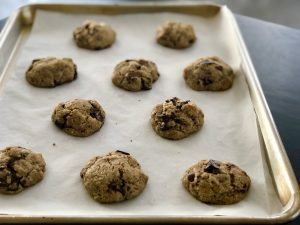 Remove and enjoy 🙂 You can store the baked cookies in a container at room temperature for up to 3 days, but it is best to just bake them fresh as you want them.